We've seen so many street style photographs, beautiful vibrant colors, fur, hats, crazy shoes, CDCs but have you watched the so called 'exit' video where photographers and cameraman chased models and how hectic yet fabulous everything looks? Here's my favorite, after Valentino. You can see how some just stormed out walking very fast, and some would pose calmly, how intriguing. Below is the trend I gathered from several street style blogs. The amazing Vika Gazinskaya in her own design, loving the fabric hand-painted necklace and dress from S/S 2012. What do you think? Images from Streetfsn and Tumblr. I heart those models who just pose calmly. I don't get why some of them even decided to storm out. Lol. ahhhh i love that necklace too! 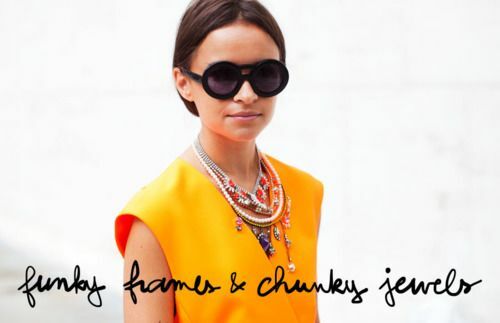 The necklace and those fun shades are perfect! lots of streetstyle waiting on my bloglovin feed is one of the best things for fashion week !